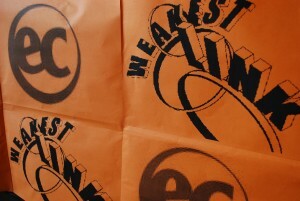 This Monday’s EC Cambridge Junior Programme welcome activity was The Weakest Link. Quizmaster Chris hosted the evening with a mixture of different categories…including world flags, pop music and even a food tasting round! You have to feel sorry for the poor person who had to taste Marmite – she hated it!! Quizmaster Chris was dressed in his formal quiz clothes and did not refrain from telling people exactly what he thought of them!